← Do bookstores need a rescue mission? Are there ever any circumstances under which it’s acceptable — permissable even — to commit a crime ? It’s a question that lies at the heart of Dostoevsky’s Crime and Punishment. The criminal in this novel is Rodion Raskolnikov, an impoverished student living in the Russian capital of Saint Petersburg. Raskolnikov sets out to kill a pawnbroker with an axe but is disturbed in the act by her sister so ends up also killing her. His rationale for his action is ambiguous but the effect on his mental state is dramatic. He descends into a cycle of anxiety-fuelled periods of delirium alternating with periods in which he is hyperactively lucid, much to the alarm of his closest friend and his mother and sister. His mental anguish is intensified by a psychological cat and mouse game with the magistrate in charge of the investigation, Porfiry Petrovich. Petrovich’s penetrating questions force Raskolnikov to at last give shape to the ideas that led him to kill the women. He believes there are a few “extrordinary people” who may have the right to commit crimes in certain circumstances. It’s a theory (known as the Superman Theory) closely connected with the German philosopher Friedrich Wilhelm Nietzsche, which according to Raskolnikov means that an extraordinary person may act without fear of consequence. …. if it necessary for one of them, for the fulfillment of his ideas, to march over corpses, or wade through blood, then in my opinion he may in all conscience authorise himself to wade through blood — in proportion however to his idea and the degree of its importance. In essence Raskolnikov argues that he murders the pawnbrokers to prove that he is himself one of the members of this elite group, a man of genius like Napolean Bonaparte, absolved of legally mandated punishment as long as he acts in pursuit of his great ideas. But what he cannot escape is the feeling of torment, ‘the darkness and confusion in his soul’ which is more of a self-inflicted punishment that will not diminish unless he can acknowledge and atone for his actions. On the surface Crime and Punishment belongs to the crime fiction genre where a crime is committed within the first few pages and the rest of the novel is devoted to the question of whether the police will catch the person responsible and bring him to justice. But since we already know the identity of the killer the reader’s interest is much more closely directed to the psychological dimensions of crime. It’s a novel based on a deep and relentless examination of the murderer’s psyche as he tries to reconcile his anguish over the deaths and his fear of arrest with his belief that he was justified in his actions. Dostoevsky gives us a double voiced perspective, switching from omniscient narrator to interior monologues so that reading the novel, I felt I was both an observer of the effects of Raskolnikov’s actions but also part of his own consciousness as he borders on derangement. It’s a novel that grabs your attention and doesn’t let it go at any point. Dostoevsky demonstrates a superb grasp of the reality of human nature in its most dire and bleakest form. As depressing as much of it undoubtedly is, the darkness is counterbalanced by the pure goodness that Dostoevsky suggests can be found in the most humble and desperate of circumstances. The self -sacrificing young prostitute, Sonia, embodies hope for Raskolnikov, showing him that there is a chance for his salvation if he can follow her example of a life lived with compassion for others. As the novel ends on a note which indicates the possibility of redemption, forgiveness and regeneration. Posted on June 8, 2013, in Book Reviews, Classics Club and tagged Crime & Punishment, Dostoevsky. Bookmark the permalink. 14 Comments. You might consider replacing “Hegel” with “Nietszche” in the text. Nicely done, though! Thanks Jeffry. So much for the accuracy of the introduction to my edition. However it’s a good lesson for me to check sources myself. What a wonderful book! When I studied abroad in Russia, I got to visit the apartment building where Raskolnikov axed the old lady, as well as the building where he lived, which even had a commemorative plaque on the front. I loved that he used real places to tell his story. I’m also a fan of the way that Dostoevsky handles his female characters. He’s one of the few writers from his time period that treats them as complex characters rather than mindless idiots (*cough* Tolstoy *cough*). I wasn’t all that enamoured with Sonya but thought the way he portrayed the consumptive Katerina Ivanovna was superb, especially in the scene after her husband’s funeral wake. Raskolnikov’s sister Dunya was a strong character too. Lucky you to be able to see places from the novel. I found it interesting how Dostoevsky went against the traditional representation of a Russian city. We always expect these novels to show Russia in deep snow, freezing conditions but in this novel it’s the heat that prevails. Petersburg doesn’t really get that much snow because of where it’s geographically located. It’s far more likely to get a lot of cold freezing rain, which somehow feels worse. I like how the city itself featured almost as prominently as a character, seeming to guide Rasolnikov’s aimless wanderings. At the same time, I don’t think I could have managed wearing the spiky heels that Russian women do. I wouldn’t have been able to walk without falling down. I went through a period when I read a great number of Russian novels but somehow missed out on this one. I have a feeling that I would become extremely annoyed with a young man who feels he needs to take the life of another to prove how superior he is and wouldn’t get halfway through as a result, but maybe some day I should give it a try. He was certainly an irritating person but I found Dostoevsky’s style compelling. I’ve read a few of the biggie Russians in the past but never anything by him before. Next up when I get around to it will be Brothers Karamazov. Have you read that one? No, the only book of his I’ve read is ‘The Idiot’ and that after I’d seen a stage adaptation. 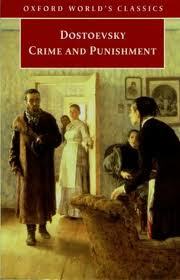 I did enjoy it thought so perhaps all is not lost for ‘Crime and Punishment’. I actually pinched the title as the heading for the Summer School three years ago which was centred on literary detective fiction but it wasn’t one of the set books. I didn’t think I’d be very popular setting a Russian classic as a summer read.